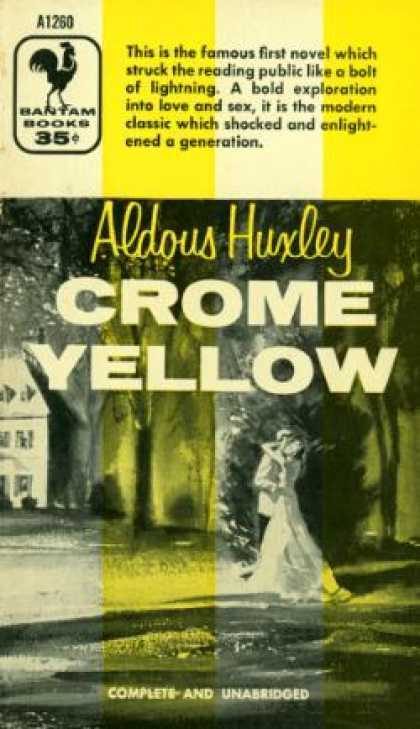 The latest book club discussion was on Aldous Huxley’s Crome Yellow, which stands out from becoming solely a house party novel (tales of the idle rich vaguely being creative between meals) as there are diversions provided in the form of tangential recollections, notably with baroque anecdotes about dwarfs. The chief criticism was the fact that any reading would be heightened with contextual knowledge (Lady Ottoline Morell, Dora Carrington, painter Mark Gertler and a Sackville West all recognizably feature) but without being a loyal obsessive of the Bloomsbury set and those in their wake, the story may not be that satisfying. There is nothing wrong with the novel being of its time – despite the risk it runs of being taken out of print – in fact, this is not so much of a problem when the level of parody becomes apparent. One loyal member claimed she laughed out loud at several points, but the rest of us were fairly unamused. L.A.G. Strong wrote in 1932: “Mr. Huxley has been born too late. Seventy years ago, the great powers of his mind would have been anchored to some mighty certitude, or to some equally mighty scientific denial of a certitude. Today he searches heaven and earth for a Commandment, but searches in vain: and the lack of it reduces him, metaphorically speaking, to a man standing beside a midden, shuddering and holding his nose.” This suggests that Huxley’s contemporaries didn’t feel he really fit in either. However, despite the unfashionable themes, there are some wonderfully drawn characters, such as Mr. Scogan, who describes an “impersonal generation” of the future that will “take the place of Nature’s hideous system. In vast state incubators, rows upon rows of gravid bottles will supply the world with the population it requires. The family system will disappear; society, sapped at its very base, will have to find new foundations; and Eros, beautifully and irresponsibly free, will flit like a gay butterfly from flower to flower through a sunlit world.” This relentless, reptilian character is a well-drawn nightmare (and precursor of Brave New World) , a compellingly boring nerd who masterfully takes advantage of simpler minds at the county fair by seducing a few rustic ladies in a fortune teller’s tent. This seems to be how Huxley draws you in – one minute predicting the end of days, and the next diverting you with a farce in a fairground. He is easily recognizable as the weedy lovelorn poet protagonist Denis, and yet at the same time he is also Jenny, the deaf and devastating caricaturist who laughs silently at the lot of them. This also formed the basis for many of us comparing the subject matter and execution with Waugh (more Scoop then Sword of Honour). Huxley may not have aged well, but we all agreed he should be read besides Brave New World, that we would rather have read it than not and remained mostly entertained. We may be a tough crowd.